Top right, Bob Sandstrom happy with his violin. Bob's precision and sense of fun marked his every performance. ONLY A HANDFUL of musicians reside comfortably in the diverse and myriad worlds of music. Robert Sandstrom is one of them. Friends said farewell Monday in an emotional celebration at Mission Basilica San Diego de Alcala. After a heroic 18-month battle with an aggressive cancer, Bob is free of pain. Perhaps he'll once again play the violin he couldn't lift during his decline. 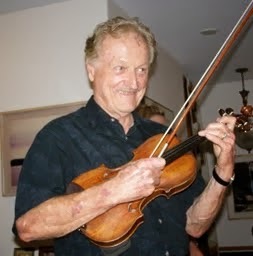 WHAT A GIFTED violinist was our versatile virtuoso friend! He could play church hymns in the morning, tea-time tunes in the afternoon then honky tonk, jazz and blues at an evening jam session. Maybe a little evening vespers with a dash of country swing for sweet dreams. Bob, left, mixes it up at a patio party with his pal Salvador. played with the greatest of ease. He was a musician for all seasons. He endures in his music, for through art, we live on. I REMEMBER the night Bob and I met at a friend’s home. We were the entertainment. We were immediate friends, alternating “do you knows?" and ticking off songs. Sometimes my chord changes were a bit rough – I hadn’t played the bridge to “Smoke Gets in Your Eyes” for years, and I’d never played the opening of “Dark Town Strutters Ball.” But we were a hit -- with songs from “Evita,” "Man of LaMancha" and “West Side Story,” Mexican folk tunes, Irish jigs, ‘40s standards, Beatles tunes, even opera arias. younger man in his convertible! THAT NIGHT was effortless but Bob was precise and he liked other players to be, too. I stretched with Bob and for several sweet years, we played together in friends’ homes, my place, at hotels – I on uprights, grands, electronic keyboards and Bob on his fiddle. Our soirees were accompanied by fabulous food and wine, animated conversation and applause. 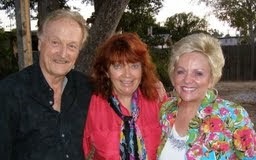 Through his illness, my partner, Bruce Keller and I kept in touch with Karlene, attempting to buoy her spirits. I know something of her loss for I have twice been widowed. The cancer that killed Bob also took my second husband. BOB'S PRIZED pernambuco bow was dear to him. Recommended for advanced students, it is known for its ability to provide instantaneous feedback. Bob and his bow collaborated for gypsy folk tunes, Bach fugues and ragtime. The dense pernambuco wood is orangish in color – not unlike Bob’s sandy hair once was – and the bow is known for its effortless feel – a quality Bob possessed in spades. Monday's memorial featured many musician friends paying homage. "Dear Karlene: It occurs to me that Bob and his beloved pernambuco violin bow have much in common. We listened as Bob described the wood’s wonders and depth of sound. As he listed its virtues, we were struck by the parallels between Bob and pernambuco. Like Bob’s music, pernambuco is resilient. Like Bob, it is beautiful to admire and listen to. Like Bob, it is classic and time honored. We are thrilled to know Bob is surrounded by the music he so loves. 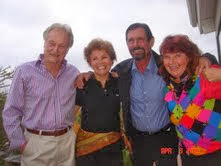 He is "human pernambuco,"
Bob, left, with friends Gloria, Keller, Cookie. a marvel of nature, a true and profound talent. Your love and caring for your sweetheart touches our hearts. We hope to hear him play again, holding his pernambuco bow with grace and precision. Pernambuco is a treasure protected by the Brazilian government. Bob is a treasure, too, protected by all who love him. Please give him our love and keep his precious violin tuned and his bow at the ready!" A sense of fun always enhanced Bob's playing. friends gathered Monday to play and sing at his memorial. 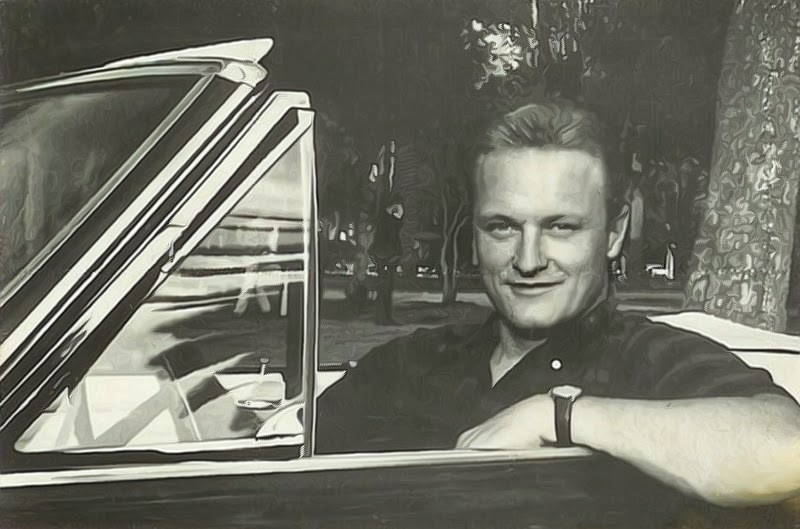 BOB WAS bilingual and loved the southwest and southern California. I enjoyed hearing him speaking Spanish to our many Hispanic friends in the San Diego area. And he loved to play tunes inspired by that part of the world – we once improvised a whirling “Espana Cani,” a famous Gypsy inspired piece. I began the familiar rhythms and Bob joined in. Our room of 20-plus friends burst into a standing ovation – before returning to the paella that they'd abandoned. Bob's only son and brother are gone, too. 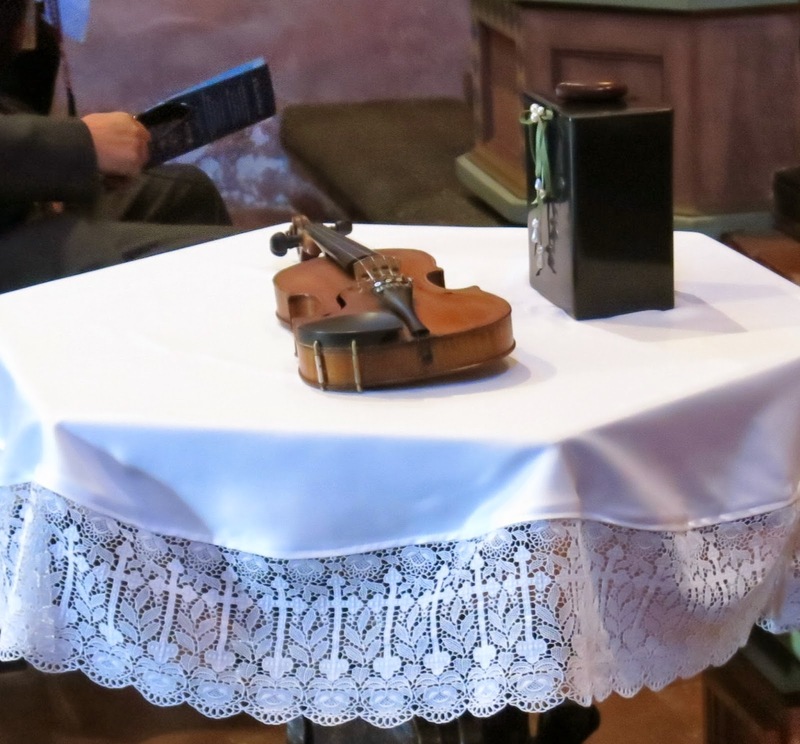 And Karlene revealed that he gave up for the violin for several years after the death of his infant son, Bob had given up violin. She brought music back into his life! Karlene was his muse and he also deeply loved his daughter Robin, her husband, Stavros Papaconstantinou of Athens, Greece and their children: Anna Paola, Alexia and Dimitris. May they continue Bob's global musical interests. Bob’s only sister, Charlotte Gritton of Arizona, told me the music-filled service was "a most fitting tribute for my talented brother. He would have loved every minute of it!"